On October 2nd, 2018, Zambian Energy Regulation Board (ERB) Chairman, Mr. Raymond Mpundu announced nationwide upward fuel price adjustment stating that the “[crude]oil prices have increased on the international market”. Whilst that could be a valid reason for any government to adjust the fuel prices, The Movement for Economic Emancipation (MEE) and other responsible entities, were at variance with the reason stated for the increase and issued a statement challenging the rationale behind the upward adjustment of the commodity at the pump. MEE’s stated reason for challenging the government for this price upward adjustment, at the time, was that “it was not the first time the Zambian government had given this questionable explanation to justify the increase on fuel prices”. MEE further stated and explained that according to the Energy Information Administration (EIA), there is still an abundance of Crude Oil Commodity inventory around the world, despite the upward adjustment in Crude Oil Commodity we have seen (in Zambia) lately.The successes of improved crude oil extraction technologies in horizontal drilling and fracturing is the reason we have an abundance of the commodity in inventory. Though we continue to experience rapid fluctuations in the pricing and an occasional upward spike resulting from geopolitical imbalances, these fluctuations are widely believed to be non-sustaining and are easily countered by the supply abundance.MEE also believes that the government should be justified to make needed price adjustment in those circumstances.However, what the Zambian government has not been known to do was making those similar downward price adjustments when the Crude Oil Commodity price on the global market adjusts in the downward direction. 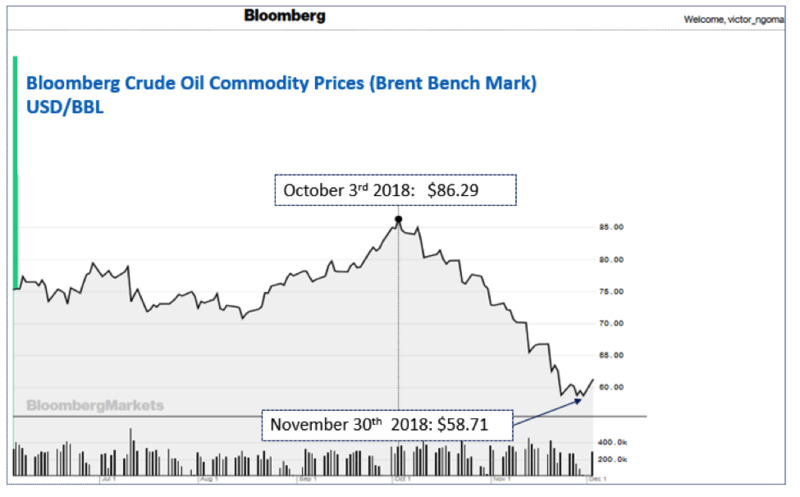 According to Bloomberg News – Commodity Markets (Energy), in the months of October and November alone, the Crude Oil Commodity on the global market has plunged from the high of $86.29 per barrel on October 3rd, 2018 to a low of $58.71 as of November 30th, 2018 on the Brent Benchmark (there are 42 gallons in a barrel).This drop alone represents a remarkable $27.58 per barrel or 32% plunge in the Crude Oil Commodity. MEE conducted a representative survey, around the world, on fuel pump prices and the indication is that there is a corresponding downward price adjustment from around the world due to this declining Crude Oil Commodity on the global market.MEE would like to appeal to ERB and its Chairman, Mr. Mpundu, and the Zambian PF government to give a fuel price break to the citizens of Zambia as we go through economic challenges. We believe and are ready to challenge the ERB argument that the current crude oil feed was purchased previously.Unless the ERB is willing to reduce the price of fuel in the next few days, that argument is of no consequence. We believe that the Zambian government sources its Crude Oil Commodity from the same place where the majority of countries source its feed.It is therefore disingenuous on the part of ERB to not reduce the fuel prices accordingly.We would also urge the ERB to consider hedging strategies at these low prices to ensure the stability of fuel prices in the country. As a citizen led movement, MEE echoes the voices of millions of all of us ordinary Zambian citizens appealing to the PF government to extend the benefits of these sustained reduction in world crude oil prices to us. We desperately need an expenditure break in these very economically challenging times. By Victor Ngoma, MBA ? Crude oil transaction are done in the fututres market, which is three months or more.Therefore a sudden price drop on the international market market cant immediately translate in a reduction beside the current stock was bought at a higher price. i dont control the market neither does the govt. I am with Victor and I have alluded to these sentiments over and over again. PF needs to listen to the plight of the citizenry and adjust things as you go. My UNIP died when we stopped listening to the smart people of the Zambian Enterprise and I am afraid to say PF will follow suit if they don’t listen either. This breed called Zambians are the smartest breed on the continent of Africa, you ignore their cries at your own peril. I can always count on them to make the right decisions for their loved ones even when it comes to the ballot box. PF should not start thinking they have them in their pockets, their main loyalty lies only in what they perceive to be in their best interest. To continue in power, a party has to constantly evaluate its performance as regards to what they are doing for the common Zambian not just the elite. You asking a kaponya to reduce his mark up…really laughable…simply listen to that young Kipiri MP’s speech in Parley. It’s not a light switch to turn on and off! The old stock was not bought at the new price. I guess in Namwala cows are selling low because there was a lot of rain and plenty of grass after the drought. Enjoy HAKAINDENOMICS from Paradise Papers in PANAMA. The PF will NOT reduce prices. They will keep claiming that they bought a year’s supply of crude at the higher price. And when the price of crude rises, they will pass on this increase to consumers immediately, claiming the crude purchased was only meant to last for 6 days. Citizens, you are on your own on this one. Let them reduce the price.Ba lungu please tell these crooks fi ERB to reduce the prices.Don’t take us for granted.Ala imwe guys.All countries are reducing the prices u want pipo to start demonstrating kanshi. Don’t steal from the poor coz u want money.U’ll never live for more than 100 years.your Money will be just be used by foreigners.Think about leaving good legacy for the country n young generation.U behave as if u gods. Its indeed surprising at how ERB moves at supersonic speed to adjust upward fuel pump prices whenever there an increase in prices of crude oil in the international market and does nothing when the prices of the same crude oil plunge.The inertia by ERB to adjust the prices downwards is not only appalling but also a scandal of the highest order because the same reasons advanced for upward adjustment should also apply for downward adjustment of fuel prices. Pf was formed through rumours and lies and misinformation. And thats what upendi is doing now. There is no justification as to why pump prices should not go down. Kwacha has gained slightly against the dollar and crude prices have been on a decline and still is declining. Other countries have responded positively and have reduced pump prices. ERB must just do the same to cushion future increases when crude price goes up. This is not about holding a PhD or MBA. It is about managing an economy. High fuel prices affect the economy negatively and so must be controlled. Cheap fuel will boost agriculture as input distribution costs will reduce. ERB, do something please. Its not popular here to say this but fuel prices won’t reduce immediately ,its not a good business strategy for hundreds of fuel retailers or for GRZ to sell their older stock at the new lower prices. A reduction in price will stimulate the economy in terms of much needed revenue. Yes, its a short fix but its better than we’re experiencing. Bu they dont have a problem to increase fuel at the pump with 24 hrs when the market price increases…this is what you get when there is no transparency and accountability; fuel procurement and tendering is rotten filled with crooks for middlemen. No govt has the courage to tackle this issue remember what happened to Wynter’s commission of inquiry back in 2012…he suddenly became a player in the sector after that. Zambians will never benefit from the fall in crude prices. The economy has been mismanaged manifesting in high inflation and interests rates which has created unnecessary costs driving the kwacha ever downward. The benefit that should accrue in the fall of crude oil are wiped out by the depreciating kwacha against the dollars. A lot of dung has accumulated at the FARM because a lot of COWS have been mismanaged in NAMWALA. EAT MORE CHICKEN. Asking the PF or piffle to reduce the price of fuel because of the stated reasons is like asking Hichilema to refund what he made from the sale of companies, it can’t work. Release the Wynter Kabimba Oil Tribunal findings if you are men enough. What sales did HH make? Was he in govt at the time? If yes, then why isn’t he jail? Show us facts instead of your fake-news. Zambians (apart from you, presumably if you are a Zambian too) are no longer fooled by that cheap arguement. If govt wont reduce I wont be suprised because we need every ngwee to pay off our China/Euro bond debt, amirite?? We do not have leaders anymore, lungu and his government are simply hungry people trying to make a way out of mystery, this clueless Lungu doesn’t have the guts to face reality, his an example of a failure. Just increase it to k100 per liter! Too much pollution from Cars! Instead of constantly arguing about fuel prices, can our Engineering minds start thinking of Electric Cars! We must begin to think outside the PF and UPND small boxes! The government should not reduce the price of fuel because consumers do not benefit from such reduction. Infact reducing fuel price will be a cost to consumers in future. For instance, the current fare from Lusaka to Kitwe is K150.00 if you reduce the fuel price from K14.65 to say K13.50 transporters will not reduce the fares, but when the price in future is increased back to 14.65 transporters will say there is an increase of price in fuel so let us adjust the price. It is better the extra money gained channelled to other road projects. The reason is simple because prices are flexible upwards and inflexible downwards. The key is to management the economy properly before coming to this situation.